Some day I am going to lose my Disney Fan Card...I just know it. I am always behind - I haven't been to a Disney park nearly as many times as my friends and peers, I don't usually see movies until they are on DVD/Bluray, and I still don't own a pair of Mickey Ears. But I digress...The point is I finally saw Saving Mr. Banks yesterday, as a matter of fact Mike bought it for me a week before I took the time to set down to watch. But I am a believer of fate, karma, divine intervention - whatever you want to call it. I definitely watched this wonderful movie at exactly the right time for me. First a little backstory. My Dakota is meant to be in the entertainment industry, I've known it since he was very young. Of course, I really thought he would become a famous guitarist but in the last year or so his interest have swayed to the movie industry, in particular becoming a screenwriter and director. Coming from a family where I had dreams of becoming a fashion merchandiser or television news report squashed by my own parents I knew I could never do that to his dreams of making it big in Hollywood. My husband is a much more practical man and as such he wasn't too keen on the idea when he found out about it on Saturday. As usual, Dakota and I had a long conversation and he knows where we are coming from as parents - get a good education so you have something to fall back on blah, blah, blah. 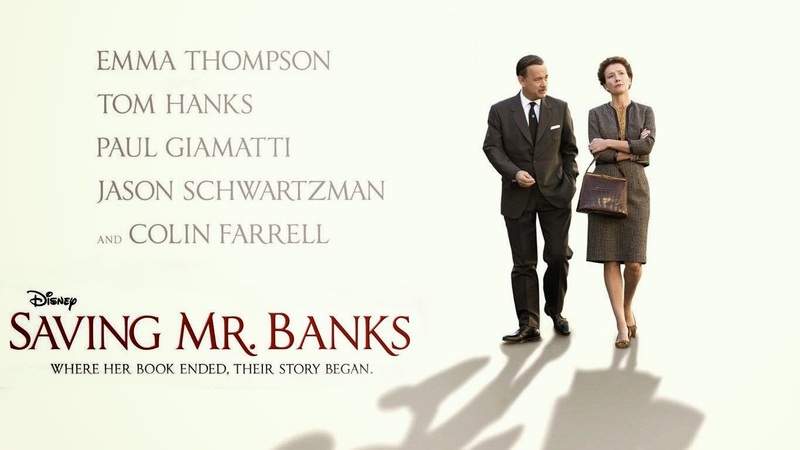 This leads us to Sunday morning and my decision to finally watch Saving Mr. Banks. I have never actually seen Mary Poppins only bits and pieces so I wasn't particularly familiar with the story, so I learned much about P.L. Travers and Mary Poppins while watching the movie. As I watched the flashbacks to her childhood and her life with her father I noticed how he had a creative soul that I felt was being crushed by his obligation to provide for his family as a banker. He could have been a fabulous writer or actor, he was such a creative and gregarious man. I am quite sure he would have been a much better provider, husband and father if he could have followed his heart. I am also sure his turn to alcohol was a way to escape from this life he was forcing himself to live. My immediate thought was I cannot do this to my son, I refuse to douse his creativity and force him to live a miserable life. So through my love of Disney I learned that sometimes you have to let your children follow their hearts and do what is right for them - not what you think is right. So Dakota, the sensible mother in me wants you have a degree you can use to fall back on if all your dreams don't come true. The creative mother in me wants you to know I believe with all my heart all those dreams can come true and that you can become everything you've ever wanted to be and MORE!! So follow those dreams and continue to let your imagination soar!! I can't wait to see your first movie, I know it's going to be awesome - just like you!! For anyone who hasn't seen Saving Mr. Banks yet - I loved it!! You should rent it, buy it, download load it and watch it as soon as you can - but be sure to have a box of tissues handy. It wasn't what I had expected going in, but it was fabulous and a definite must see for any Disney fan. EXCELLENT POST! I love this. You know, college isn't for everyone. I think it's so cool that you learned this by watching Saving Mr. Banks. I love how each person gets exactly what they need, when they need it. Perfect! Thanks Heidi! Actually he wants to go to college for directing and screenwriting, his mom wants him to get an English degree with an emphasis on Creative Writing. He wants to go to school out of state and I want him to go to Troy where he can live at home and save a ton of money, and still follow his dream. It's amazing that at such a young age Cman knows that actors just pretend and that real soldiers sometimes make the ultimate sacrifice!! Beth in preschool Dakota was a confident outgoing little guy. Elementary school sucked the life out of him, he became withdrawn and lost all of that confidence - until he got his guitar at 13. Something in him clicked and he realized he was different that the other kids but that it was ok. I love his creative and thoughtful side - things you don't find much in Alabama. He is now always at the top of in class in academics and he is his most confident on stage. This is an excellent post Donna Kay! I have a degree in Theatrical Design & Production, and I use it every day! I'm currently teaching high school technical theatre, and I love teaching the theatre skill set to my students! A few hints for Dakota: The steady money is in the technical field, so study things like lighting design, set design, props, etc. to provide a solid skill set to supplement directing and screenwriting. This will only make you more marketable and more likely to get work right out of college! Start volunteering now! Find out if any films or television shows are being shot in your area and volunteer your services. Start a YouTube channel and find a niche (check out Traci Hines series Life Lessons from a Hipster Mermaid), and then create a short serial with your friends! The entertainment industry is largely about who you know, and what they know about you! Thank you so much Lin!! Such wonderful advice!! I will pass it along to Dakota right away!! Hugs!! Red face here. We haven't seen the movie yet! BUT, I sure can identify with your parental angst; as the mom of 2 actor/singers, I know you are torn between raising a happy and fulfilled son, and the practicalities of our world. Good luck with the change of course- you have a chEARleader in me Dakota! !